The first letter asks Funakki to mention 10 good things about Osaka. Firstly, there’s good food there. Takoyaki and okonomiyaki are commonly associated with Osaka, but there are even things that she hasn’t tried out, like long potato chips at Amerikamura. 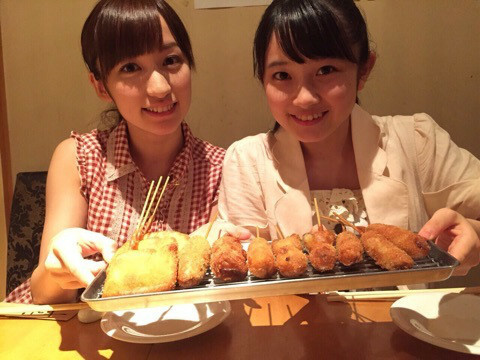 Chiitan likes Osaka’s kushikatsu, which she had with Risa-chan. Funakki was surprised that it something new to the others, as it’s a pretty common dish in Osaka. Second is that the people there are said to be funny. Though Funakki herself is shy and doesn’t think that she’s particularly good when it comes to talking. So while people might expect people from Osaka to be funny, there are unexpectedly a lot of shy people as well. Thirdly, you may get gifts of sweets as you walk around. If you meet someone that you know from your neighbourhood or drop by someone’s place for a visit, you may get offered some sweets. Fourth would be the Osaka dialect, something that Chiitan likes. Their Kansai dialect is similar to Kyoto’s, but there are some differences. People often say that Kansai-ben is cute, and it’ll occasionally slip out in Funakki’s speech. They’ve noticed Hokkaido natives Manakan and Tsubaki Factory’s Tanimoto occasionally stray from standard Japanese as well. 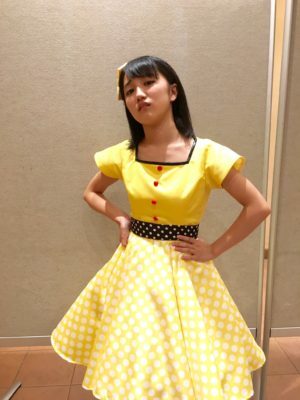 Fifth is… that Osaka has a yellow image, at least to Funakki. Given that it’s her member colour, that’s another good point. On a related note, Chiitan remembers Funakki mentioning that she associates colours to numbers. 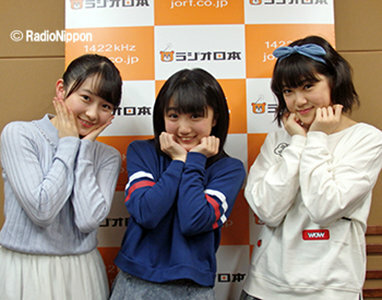 Ozeki suggests that they do the remaining five later. Funakki and Chiitan are sure that there are lots more things that are great about Osaka, so they’ll definitely follow up. The next letter hits a similar note to a topic they’d touched on earlier: With April marking new beginnings, what do you talk about with people of the same age? The girls try to find points in common at first meetings. If it’s Kenshuusei or new members, Ozeki will take a look at their official profiles. Which reminds Funakki of the profile books they had during primary school. Ozeki still does those. It’s easy to talk about things like school. But when they first joined as members of Country Girls, things were complicated, they had no idea what to talk about. For Chiitan and Ozeki, Manaka-chan and Risa-chan really took the lead, asking them questions like ‘Who’s your favourite senpai?‘ or ‘What’s your favourite food?‘ during idle time – simple questions that they could answer. The girls wish everyone in a new environment good luck in talking with new people. Their first live tour as a 7-member group will be starting in May! The next letter asks Funaki-san if there’s anything that she’s looking forward to. And if Morito-san and Ozeki-san have any advice for the new members, based on their experience in last year’s tour. Funakki is looking forward to going around here and there. On the other side of the coin, she’ll also have to build up the stamina to perform successive songs at concert. To build up her own stamina, Chiitan actually did some rope skipping at home, as well as running. 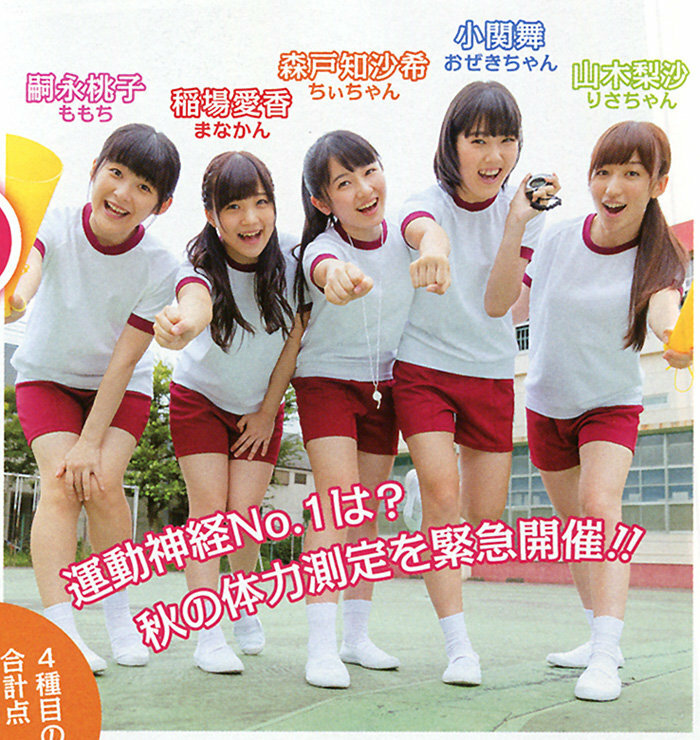 Ozeki would go running with her friends in the track-and-field club before school. Racing with someone forced her to pick up her pace and build up her stamina. Funakki does 100 sit-ups, doing 50 before catching her breath and doing another 50. Chiitan has tried it before when she was smaller, and only managed to get to 88. Quite some time has passed since their last tour, so Chiitan is a bit worried that she might have lost some stamina. So she’d like to work hard at it again, running and rope-skipping. The next letter recounts an incident where the writer went through an embarrassing experience as they were spacing out. The girls are asked whether they have any embarrassing stories to share about incidents that happened while they were spacing out as they were walking. Ozeki remembers one such incident. She had just got off the stairs and was waiting for the train at the end of the platform, immediately after the stairs. As the departure time drew closer, she started wondering if the train was late. Then she looked sideways, and realised that the train was there – it just didn’t go up to her end of the platform. Chiitan had a similar experience. She had arrived at the platform with about five minutes to spare – plenty of time. However, the train that she was expecting to arrive on one side of the platform had actually stopped on the other side of the platform instead. She only realised it when she heard the announcement that the doors were closing. She could have run for it, but she deemed that it would have been too embarrassing to be seen running and decided not to. She wouldn’t have made it in time anyway. Funakki often slips and falls, though she may not necessarily be spacing out. She recounts one incident when it happened: she had just finished up shopping, and slipped at a place with lots of people, which was embarrassing enough. She got up and continued on walking with a nonchalant expression on her face. Then she bumped into her friend’s mum, who loudly commented about the fall Funakki had taken. The girls note that fellow member Yanagawa Nanami-chan often slips and falls – even if there was nothing in her path. This makes stairs a huge hazard. So please be careful.